Mr. Hussain is the Managing Director & CEO of BRAC Bank Limited, a leading private sector bank with a market capitalization of US$685 million and a FUM size of US$4.40 billion that focuses on SME financing. Mr. Hussain is a career banker and an immediate past CEO & Managing Director of IDLC Finance Limited who is widely recognized and highly acclaimed across the financial sector for being the architect of IDLC Finance’s meteoric rise over the past six years. He was also the Chairman of the Board of Directors of IDLC Finance’s two subsidiaries – IDLC Investments Limited and IDLC Securities Limited. 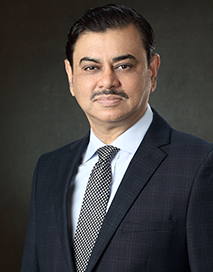 Mr. Hussain currently serves on the Board of the country’s largest mobile financial services company, bKash Limited, UK-based BRAC Saajan Exchange Limited, BRAC IT Services Limited, BRAC EPL Stock Brokerage Limited and BRAC EPL Investments Limited. Mr. Hussain has an Honors degree in Accounting from Dhaka University and an MBA (Major in Finance) from the Institute of Business Administration, Dhaka University. He worked in various roles with two of the largest multi-national banks in Bangladesh, ANZ Grindlays Bank and Standard Chartered Bank, for 24 years, before moving to the IDLC Group in 2010. He has resided and worked in India and Australia for a significant period of his career and, prior to taking over the helm at IDLC Finance Limited, was the Head of Finance & Strategy for Standard Chartered Bank’s Consumer Banking Division in Mumbai, India. Mr. Hussain was also the CFO for Standard Chartered Bank, Bangladesh, from 2002 to 2007. Mr. Hussain was also a Director at the Credit Rating Agency of Bangladesh (CRAB) and the Vice Chairman of the Bangladesh Leasing & Finance Co. Association (BLFCA).